It’s the story of an ambitious group of students who sing and dance their way through life at New York’s High School of Performing Arts. And some of Glasgow’s most promising young performers will be taking to the King’s Theatre to recreate the iconic musical, Fame. The Lyric Club is bringing the stage production - based on the 1980 film - to the city, with audiences set to be on their feet singing along to Dancin’ on the Sidewalk, Fame and Bring on Tomorrow. The musical's storyline centres around some of the school’s determined students including the talented but dyslexic hip hop dancer Tyrone, comedian Joe, violinist Schlomo and the fame-obsessed Carmen. Alan Jones, the director of the Lyric Club’s musical, explained: "It’s full of vibrancy, exuberance and although it's from 30 years ago, the music and the choreography looks fantastic today. "It’s a show that has a lot of depth, I think people dismiss it as a musical but if anything it’s a period piece from the early 1980s. There’s wonderful solo work and duets and really quite a moving story. "Within it you have got comedy but also a bit of tragedy because one of the characters Carmen goes off the rails. When she goes to LA her whole world falls flat. She’s on drugs and her character eventually dies - but because it's a musical it doesn’t stop her coming to life for a big finale. "The show actually has a lot going for it and a wonderful score. In my mind it’s quite different to the film. It’s right in your face from the word go, there’s great choreography and it works well with our cast who are mostly between 18 to 30, and the 17 and 18-year-olds are fantastic as young hopefuls at the arts academy." Fame kicks off its run at the King’s Theatre on Tuesday, March 5 with shows each day until Saturday, March 9. The Lyric Club formerly known as the Glasgow College of Music Opera Society, was established in the city in 1902. In recent years the club has produced two shows a year with a big scale musical running in the spring time and smaller performances of Stepping Out and Allo’ Allo’ at Cottiers Theatre in autumn. 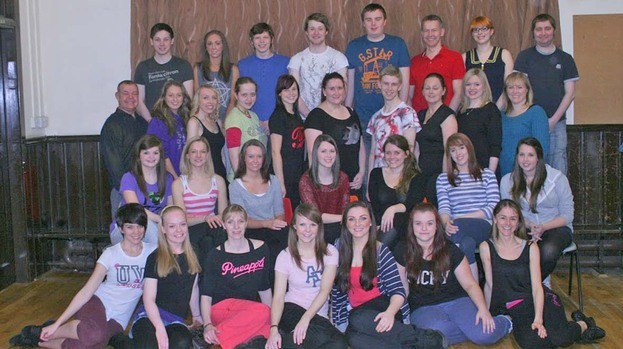 Members rehearse on Monday nights from 7.30pm at the Minerva Club on Burnbank Terrace. Alan, who has been involved with the Lyric Club since 1999 but has directed around 150 productions over the last 30 years, added: "It's worth coming along to Fame because you'll be seeing a real feelgood show. "The King's Theatre is a wonderful, magical venue for the musical. This is my 46th production at the King's and I know there are few non-professional companies that can afford to perform there but it's great for some of the younger members to get that experience on the King's Theatre stage." Tickets for Fame: The Musical are available priced between £14 and £22 online or by calling the box office on 0844 871 7648.